Leonard was born at Low Lee Farm in Sutton on 22 December 1898 to William and Mary Ann (nee Allen), the seventh of ten children (two died young, unfortunately). Around 1909-10 the family moved to Butterlands Farm in Wincle. In 1911 Leonard was attending Wincle School. We have found few details on Leonard’s military service. Being only born in late 1898 he would not have been called up until early 1917. 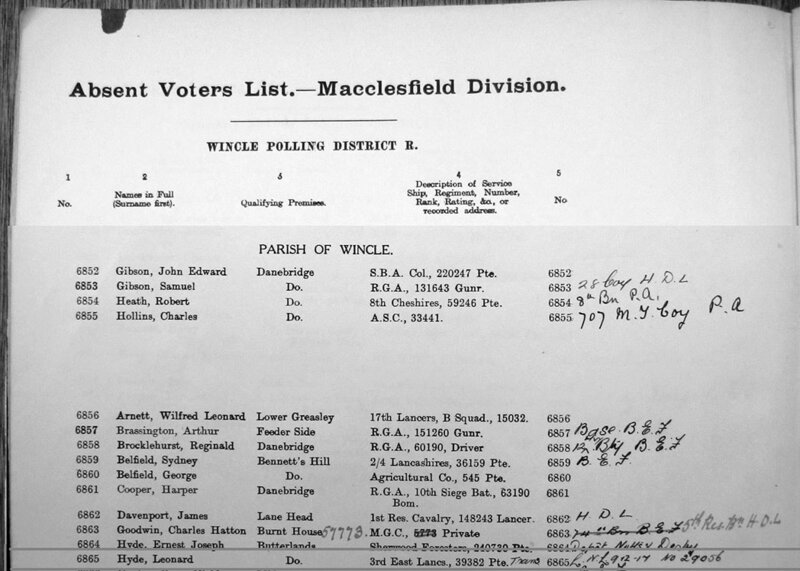 According to the Absent Voters List he joined the East Lancashire Regiment as private no. 39382 but transferred on 9 December 1917 to the 1/5 Loyal North Lancashire Regiment as private no. 29056. We have found his medals roll and index card only for the latter. He was awarded the British War and Victory Medals so must have seen action overseas. He had returned to Butterlands by 1919. Leonard moved with his parents to Hollin Sett Farm in Sutton in 1920, married Elsie Bolshaw in 1921 and settled in nearby Low Lee Farm where he’d been born. Son Arthur was born there in 1922 but the next three children were born at Cophurst Farm, also in Sutton, where the family had moved to. He died in August 1967 and is buried in St James Churchyard in Sutton. Leonard’s brother Ernest also appears on the Wincle Memorial. Their brother Arthur was also called up but applied for exemption and was successful in September 1917.